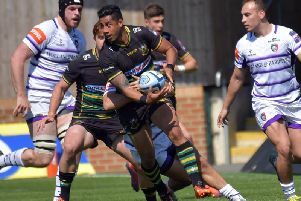 Wood was not involved in the European Challenge Cup quarter-final defeat at Clermont Auvergne or the Gallagher Premiership loss to Gloucester last Sunday. His most recent outing came from the bench in the win at Leicester Tigers last month. But with Saints suffering injury problems in the back row, Wood is ready to make his return in the key league clash with Harlequins this weekend. And the experienced flanker said: "As a competitor you want to play every week. "It's one of those things - you ask for rotation and then when you get it you're frustrated because you think 'I'm the man and I should be out there'. "Every man backs himself to perform and to be No.1. "It wasn't rotated in the past two weeks - I wasn't picked, let's be blunt about it. I wasn't selected because I wasn't seen as the man for the job for the weekend. "You've got to put your ego aside and make sure you do a job for the team, in terms of training, preparing the lads and staying absolutely on top of your game during the week. "It's a case of making sure I take my opportunities and I share the load when I get that chance." And he added: "I've not been involved in the past two weekends and I was only off the bench at Leicester, where I only featured for 15 minutes, so my body isn't as beaten up as it has been in previous years. "I'm hoping to have a big involvement this week and to share the workload because Lewis (Ludlam) has been at the coalface and had a few knocks, Alex Moon picked up an ankle injury and Heinrich Brüssow took a knock to the head. "We need to share the workload and make sure the likes of myself, Jamie Gibson, Teimana (Harrison) and Mitch Eadie are stepping up." Wood has been given a new lease of life by the fresh atmosphere in the corridors of Franklin's Gardens this season. "I'm really enjoying it," said the 32-year-old, who signed a contract extension in February of this year. "It is enjoyable, you always feel like you're getting something out of it, you always feel like you're improving as a player and that you've got your work-ons and individual skills to do. "There's generally a really positive attitude around the place. I know that's easy when you've got fresh faces around the place, you've got fresh coaches and we need to keep evolving to make sure we sustain that and keep building, getting better week on week, year on year. "This season has been a breath of fresh air with new guys coming in, new targets, new challenges, lots of young guys playing. "I've been the old 'Squadfather' out there a few times and it keeps you young trying to keep up with those lads. Saints need to win at Harlequins to keep any realistic hopes of finishing in the Premiership play-off places alive. The black, green and gold are currently seven points behind fourth-placed Quins with four games to go. And Wood said: "They're where we want to be at the minute so it will be a big scalp for us to go down there and win. "We've made it hard for ourselves and we'll have to do things the hard way if we're really serious about finishing in the top four. "It's knockout rugby because we've got to get a win to keep our hopes alive. "Harlequins are a good team. I've not been following them especially closely but they've got some strong ball carriers, some individuals who back themselves ball in hand, some elusive runners out wide and they've got a real threat over the ball with Dave Ward, Jack Clifford, whoever will play. "We're going to have to be on our mettle at the breakdown and that's a constant work-on for us. "We play this nice attacking brand of rugby but to do that you need quick ball and to make sure you don't expose yourselves by leaving too much space between the ball carrier and hopefully we'll be on top of that." Wood feels this is something of a season-defining clash. He added: "The difference between winning this week and being in a serious hunt for top four or losing and being in a real scramble for top six at best and being right down in a bun fight with the others is massive. "It will kind of define our season a bit really. "On the whole we're pretty positive about the way our season's gone but we've let some crucial games go that have meant we're not quite where we want to be. "If we can't finish these last four games with four wins - it is doable - we will look back with regret because we'll think we should have played better against Leicester at Twickenham, we missed out against Bristol in the last play of the game and we lost to Newcastle. "Those are three games we really should have nailed so we've got our work cut out in these last few weeks."